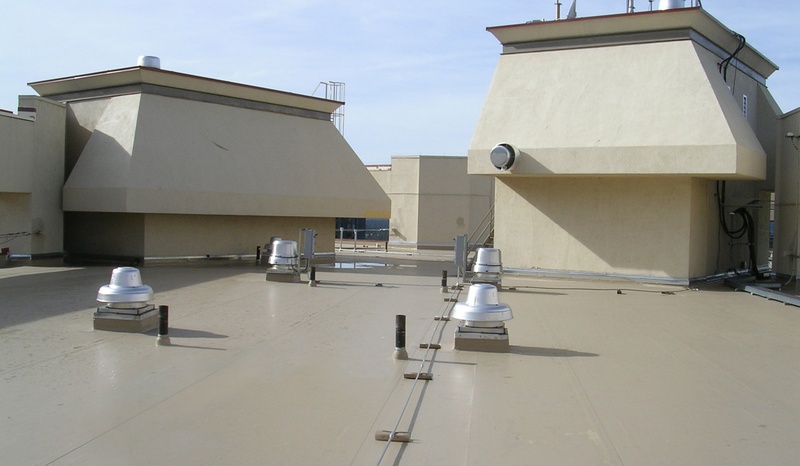 The edge of every low-slope roof can become the cause of serious waterproofing and roof system failures. A report referencing insurance industry estimates shows wind-related events result in more than half of all insured disaster losses, which totaled over $300 billion between 1988 and 2007. These instances of roof damage and failure are due to insufficient edge securement. They're representative of the lack of adequate design, detailed roof edge specifications and code enforcement that's prevalent in the industry. In 2003, the ANSI/SPRI/ES-1 "Wind Design Standard for Edge Systems Used with Low-Slope Roof Systems" was adopted into the International Building Code (IBC). This standard details the specific requirements for performance testing of edge metal systems, which, if properly applied and enforced, could dramatically reduce failure and losses due to damaging weather events. Why Use Code-Compliant Roof Edge Systems? The roof edge serves as the first line of defense when severe weather strikes. While perimeter edge metal systems are typically only 1% of the building cost, they bear the load when failures occur. The roof perimeter, an area susceptible to failure, often doesn't receive the due diligence it deserves. Consequently, in the '90s, several organizations — the American National Standards Institute (ANSI), the Single Ply Roofing Industry (SPRI) and Factory Mutual (FM), a conglomeration of insurance entities — began working together to put in place rigorous testing and standards to address wind uplift needs to reduce failures at the roof edge. The detailed output adopted into the building code (ANSI/SPRI/FM 4435/ES-1) ensures there's a performance standard for wind design on edge systems used with low-slope roofs (FM 4435 was added into the code in 2015). IBC 1504.5 states low-slope membrane roof systems' metal edge securement be designed, installed and tested for resistance in accordance with the ANSI/SPRI/FM 4435/ES-1 standards for wind uplift. ANSI/SPRI/FM 4435/ES-1 is the industry-mandated standard that outlines wind-resistance design requirements for edge metal fascia and coping systems on low-slope roofs at or less than a 2:12 slope (9.5 degrees). The IBC was updated in 2015 to reflect additional protections outlined in FM 4435. Adhering to the building code for roof edge securement is critically important. Roof edge failures should never be an option. Holding to a specification that’s compliant with ANSI/SPRI standards protects the edge, the roof system and ultimately a building's contents against harsh weather conditions and failure. FiberTite offers a full lineup of code-compliant roof edge solutions — from fascia and coping to gravel stop and drip edge. Many failures and costly repairs are preventable by using an ANSI/SPRI/FM 4435/ES-1 tested edge securement system. See how FiberTite has you covered.